European Youth groups have set up a tent just outside the entrance of Hotel Maritim. They have got two camels (they look like Llamas though) from Dortmund and are offering anyone, who wants to, a ride on the camels. There message is: Shrinking targets, growing deserts. The campaigner said that they are getting people used to riding camels because what is that they'll do if they do not make huge emission reductions. Few Greenpeace activists have locked themselves inside a truck just outside Hotel Maritim. They have a generator inside with which they are blowing the very loud CLIMATE ALARM. They are gracious enough to distribute ear plugs to journalists and those standing nearby. A few policemen were also seen asking for ear plugs. Firefighters have arrived and are trying to cut the locks to stop the alarm. The event is making a huge statement and is causing much excitement among the delegates.Will keep you updated as and when the activists are stopped. Firefighters failed to cut the locks put up on the truck by the activists. They finally cut open the cage and arrested the activists. Volunteers from Christian Aid, Danish Church Aid and APRODEV dressed as Human Clocks campaign everyday in the morning at 8:30 just outside Hotel Maritim, the Bonn II Climate talks venue. They collect signatures inviting people to pledge to campaign for a fair and effective climate deal in Copenhagen. 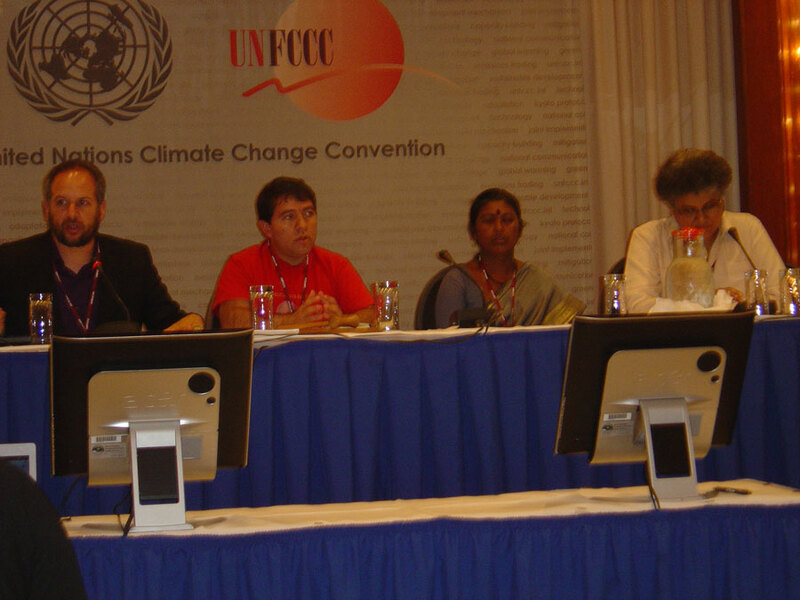 The UNFCCC meeting in Bonn [June 1-12, 2009], also known as Bonn II started with a hopeless situation. It showed some rays of positive light in between. 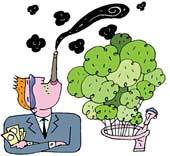 But with Japan's emission reduction proposal, it turned to a negative side. We are distressed that during the whole session, issues of great importance to the group are being subject to conditionalities and delay by our negotiating partners. It is very disappointing and frustrating to note that in the ongoing negotiations under many agenda items, our partners have shown their unwillingness to even continue discussing issues, trying to find every opportunity to ensure that it does not even appear on the COP 15 agenda. The group of G77 and China is greatly concerned with the lack of progress on Capacity building under the convention and Kyoto Protocol and lack of flexibility to address the factual capacity building needs for developing countries. The group has made group progress after a slow start. First reading of entire text is complete. Second reading of text on adaptation, technology and financing is also finished. But the text is getting bigger and bigger. All the parties are putting their negotiating chips on the table and it just keeps adding to the text. Everyone just wants to get in their proposals and real negotiations and drafting will start only in the next intersession in Bonn. In addition to this there have been five formal submissions from governments giving a legal framework for protocol. The Costa Rica proposal ruffled a lot of feathers in the G-77 + China as they were not expecting this. G-77 was hoping to put forward a joint legal framework. Don’t know if it’ll happen this time. Things are a lot less positive. In fact there is a major deadlock. Till now there has been no agreement on aggregate reduction targets for the Annex I countries. And as I write this the Chair of KP is holding a closed session with parties to get them to agree to some kind of conclusion for this session. On individual reduction targets from Annex I countries the list is not yet complete. The major party missing from that list is Russia. Japan is also partially complete as they only announced domestic targets yesterday and not their international targets. Almost countries have announced targets well below the expected “ambitious targets”. Mostly because these are only negotiating targets and everyone is waiting and watching others. Unlike LCA no one wants to put all their cards on the table. Australia is the only country which has made a formal legal submission seen as a basis for amendment of Kyoto Protocol. There is absolutely no clarity on the merging of the two working groups. I don’t think it will happen soon, at least not before Copenhagen. We might go into Copenhagen with two texts and also might come out of it with two agreements. Draft text is now available though not much progress has been made. A heavily bracketed text for REDDs has been forwarded for discussions at the next intersession. There have been some discussions on methodologies on how to measure reduced emissions from REDDs. “I live off waste.” Opening lines from Baida Gakwad, a waste picker from Pune. Addressing a handful of journalists here today Gakwad says that she not only sifts and recycles whatever she can from a waste dump near Pune, she also often eats the food that she finds in the dump. But an incinerator project, to earn carbon credits under Clean Development Mechanism, is threatening to rob her family and 6,000 other waste pickers in Pune off their livelihood. All of them have lost access to the dumping ground. Silvio Ruiz is facing the same situation. But thousands of kilometres away in Colombia. He represents 35,000 recyclers under the Colombia National Association of Recyclers. “The CDM is funding incinerators and landfill gas projects that compete with recycling for recyclable materials”. “Such projects are actually increasing emissions and decreasing,” says Neil Tangri of the Global Alliance for Incinerator Alternatives. “This is because recycling and composting are 25 times more effective at reducing emissions than waste-to-energy”. Ruiz cites examples. 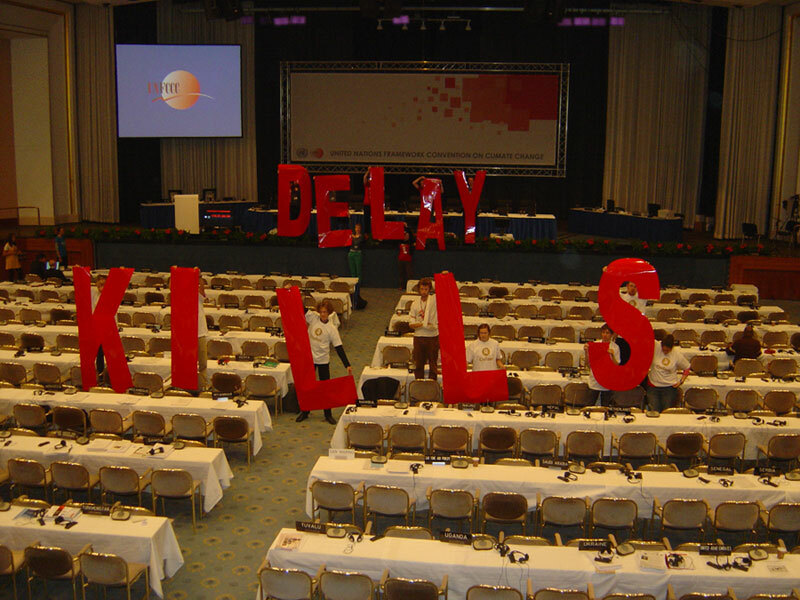 DELAY KILLS. That was the message Oxfam nternational gave to the delegates here about 10 mins back. 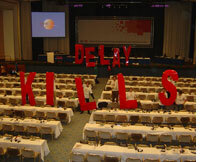 Volunteers held 2 metre by 1 metre red coloured letters inside the main plenary hall. Earlier the installation was to be held outside and journalists were asked to go to the roof to take pictures. But some security issues made them relocate it to the main plenary hall. Negotiators were seen smiling and taking pictures. One negotiator was over heard saying, “Hope people in this hall take it seriously”. It is out now. Japan announced its targets at 11 AM Bonn time. As predicted, Japan plans to cut its emissions just by 8 per cent below 1990 levels. There is outrage here at Bonn and NGOs are getting ready to protest in a major way. I can safely predict that Japan will get a extraordinary Fossil of the Day award today evening from Climate Action Network. Late evening yesterday (June 9) the SBSTA's second informal discussion on REDDs got over. Instead of removing the brackets, even more brackets were added to the draft text during the closing stages. So discussion on REDDs is far from over. The second draft now contains more brackets than the first draft. Today there is another informal consultation of SBSTA on REDDs but it is being seen as a mere formality because the decision to forward the heavily bracketed text to the next session of SBSTA is almost final. June 10: Today morning at the Plenary I of AWG-LCA Philippines complained that because of so many meetings and groups G-77 plus China have extremely limited time to coordinate. Inside news is that despite the protracted discussions G-77 plus China are not being able to come to a united stand on most of the issues. The group is heavily divided and there are major problems. Yesterday was the deadline for submissions for technology transfer. G-77 plus China, AOSIS and LDCs submitted three different proposals. In the hallways and meeting rooms the general mood has been not to expect anything concrete out of Bonn II. But the kind of progress made over the last week and a half has surprised many. 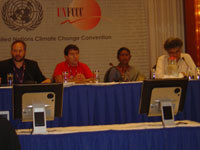 The plenary started with intense comments on developing countries mitigation measures. The entire issue of NAMAs (Nationally Appropriate Mitigation Actions), how they would work, level and kinds of actions and technological and financial support continued to be a sensitive topic. Philippines spoke on behald of G-&& pluc China stressing the clear distinction between NAMAs and mitigation commitments of Annex I. Today most of the comments and interventions revolved around the time-frame of the second (and third) commitment periods and the base year. The proposal on second and third commitment periods ranged from having two five year periods, 2013-2017 and 2013-2022 or having one eight year period beyond 2012 or having two 8-year periods. Evolving climate change science and need to review targets were also discussed. The UNFCCC meeting on Climate Change in on at Bonn, Germany. Hectic negotiation is on to reach to certain consensus on the globe’s journey to the Copenhagen COP in December, 2009. CSE’s Kushal Yadav is there and sends us depressing dispatches. Nothing seems to move. Yu Qingtai, the lead Chinese negotiator in a private conversation expressed his disappointment. In Fact China officially registered its disappointment in progress at the end of meeting of Contact group on long-term shared vision. It is coming out in the open now. Most developed countries have made it evident that they are very uncomfortable with the Kyoto and Bali Action Plan architecture and would prefer a new legal instrument. Lots happening since Saturday. Had a chance of one-on-one meeting with Jonathan Pershing, the chief US negotiator on Saturday and a good chat with him. US is having a bilateral with India this week. And he made it clear they will not sign Kyoto but are looking for a new legal instrument. Yesterday (April 3) afternoon was the plenary session of the Contact group on enhanced action on mitigation and its associated means of implementation to discuss Article 1 b (ii) of the Protocol. Highlight of the session was the spat between India and Japan. The talks are halfway through but not much progress has been made till now. In fact today at the meeting on Contact group on Annex I emissions reduction under the AGW-KP, a lot of work done earlier was undone with no clear conclusion or progress on drafting negotiations text. I spent a week at the climate change conference in Poznan, and realized the world is in deep trouble and deeper denial. Worse, the denial is now entirely on the side of action. It is well accepted that climate change is a reality. Scientists say we need to cap temperature increases at 2°C to avoid catastrophe, which means capping emissions at 450 ppm. We know global average temperatures have already increased by 0.8°C and there is enough greenhouse gas in the atmosphere to lead to another 0.8°C increase. There is still a window of opportunity, a tiny one, to tackle the crisis. The climate talks in Poznan failed on all counts. The US was found missing in post-election inaction; climate-champion EU was squabbling over the economic pain of taking action; developing countries found themselves talking amongst themselves about what needs to be done to cut emissions. Action is now moving towards finding ways in which the developed world can ‘offset’ its fossil fuel emissions—by protecting trees or burying carbon dioxide into the ground. Down To Earth brings this first-hand report on the shenanigans of the still climate-indifferent world. Guy Ryder, general secretary of the International Trade Union Confedaration, went to Poznan to attend his first UN climate meet. He sees green opportunity in the financial crisis. Pradip Saha caught up with him. 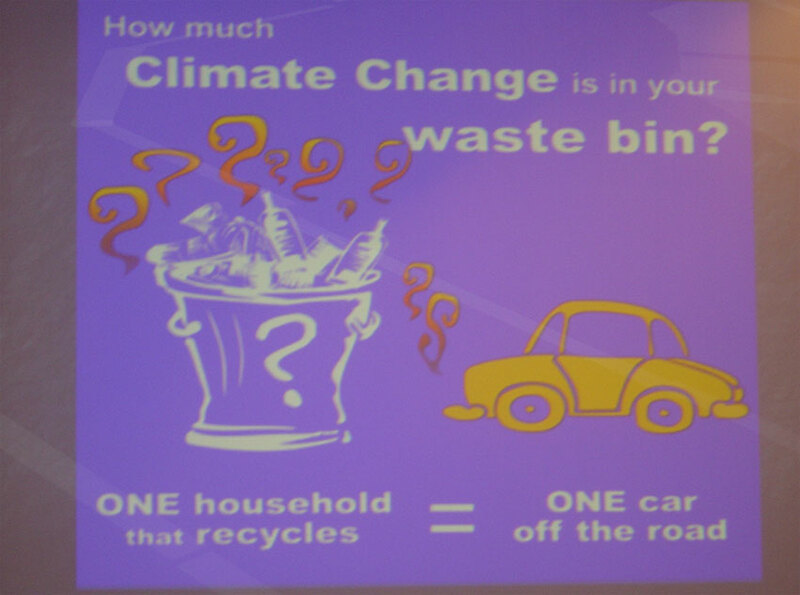 The question in Poznan is, how we will recommit the industrialized world to serious reduction of its emissions. We don't need corporate welfare. We need welfare for the people and the planet. Over the last few days of intense negotiations, Carbon capture and storage (CCS) has emerged as one of the most controversial issues being discussed at the CoP 14. The division lines are clear. Developed countries like Norway and the European Union as a whole, Australia and Japan, with strong support from Saudi Arabia, are pushing for CCS to be included as technology under the Clean Development Mechanism (CDM). At Poznan climate meet, developing nations resist thrusting of fictitious mitigation options on them. "Climate change is not the World Bank’s business"
Over hundred organizations fighting for climate justice issued a joint statement on December 9 at the UN climate talks in the western Polish city of Poznan rejecting the role of the World Bank in controlling climate change finance. The statement, signed by 142 organizations, further called on governments to create an equitable financing mechanism fully accountable to the UNFCCC and which also recognized the rights of indigenous peoples. The South African proposal for a national registry of domestic actions to mitigate emissions is gaining ground at CoP. Under the Bali Action Plan it has been agreed that developing countries will take nationally appropriate mitigation actions and that these will be ‘enhanced’ through finance and technology. The special assistant to the chief advisor in charge of ministry of forest and environment from Bangladesh, Raja Devashish Roy, told participants at Poznan that his country has set up a US$ 45 million trust fund to mainstream climate change in all line ministries and plans to do a climate change budget each year. The Energy and Resources Institute (TERI), a Delhi-based non-governmental organisation (NGO), today ‘visibly alarmed” delegates attending the 14th Conference of Parties (COP) of the United Nations Framework Convention on Climate change (UNFCCC) by announcing that India’s emissions will increase by more than seven times under business as usual scenario (if nothing is done to curb the emissions) from the existing levels by 2031/32. We have known this always. California can make technology work to its impossible and hitherto unknown potential. It aggressively and continuously pushes the frontier of technology to set new and cleaner benchmark for the rest of the world. All discussions, efforts and side events in Poznan are held with a single point agenda of getting the developing nations to take up some commitment to reduce emission. Rich nations and civil society from those nations are working extra time to cook up projects and methodologies that will force developing countries to commit actions, where rich countries will buy credit at a cheap rate and without any domestic reduction. There is no talk about the unkept promises of emission reduction by the Annex 1 countries. All programmes to mitigate climate change are being designed for developing nations. More efforts are being placed to get non Annex 1 countries to come to various market -based solutions, while no word about rich nations' unkept promises of domestic reduction of emissions. Snippets from 2 meetings. But with these two ‘predictable’ issues, there is a third issue that has made it through the cracks – how will the world share the carbon budget, which we all know is very limited by now. So, this year, unlike any CoP in the past, there are groups and proposals on equity – different ways to slice up the earth’s future. The politics are clear. The world is now moving towards accepting a 2 degree target, which means that it will need to limit emissions to 450 ppm co2e. With the world already close to 430 ppm of co2e, clearly there is little left to go around. So, the issue of sharing the resources, the budget and the burden becomes critical. On India/ China taking cutting their emissions. And how much? All countries need to contribute. It is recognised that the emerging economies also need to take action. US Congress has taken this position. But we are not talking about numbers now.